How do kids learn best? By having fun! Children foster a lifelong love of learning by enjoying their early childhood educational experiences, and this means offering them enriching activities and the chance to explore and discover in a safe, nurturing environment. When art, music, and other fun activities are included in the educational mix, it’s a winning combination! Art projects help a young person develop fine motor skills. Artistic enterprises involve a wide range of tools, anything from paint brushes and colored pencils, to construction paper and glue. These tools lead to activities that not only stimulate the imagination, but also challenge the child to move beyond an established comfort zone to try new things. In the process, creativity skills are expanded, fine motor skills are improved, and critical thinking skills grow. These are skills that will serve children as they grow and continue to learn in school, even in college, and will keep serving them in their chosen careers down the road. There’s nothing frivolous about art; it’s fun, and it’s skill-building. Every good preschool curriculum includes plenty of opportunities for students to engage in art projects. Like art, music is essential to a young, growing mind. Early childhood education programs need to incorporate musical activities in order to help the brain develop. Music can enhance learning skills in the areas of language, reading, and math, and in addition to boosting a child’s intellectual side, it serves to improve social skills. What’s more, it can help a child feel joy (and don’t we all want this for our kids?) while serving as a relaxation and centering tool. Everything from focus to memory retention, and from creativity to self-expression, can be improved by introducing musical opportunities to a young child’s life. It’s been said that a child’s “work” is playing. This is so true, because during both structured and unstructured playtime, your child is learning so much. In a 2007 study reported by The American Academy of Pediatrics, researchers note that play is crucial in the healthy development of every child, contributing to a child’s cognitive, social, physical, and emotional well-being. Never underestimate the power of playing! A preschool or other early childhood education center needs to be vibrant and alive for the benefit of your child’s mental development and emotional wellbeing. Bright colors naturally draw children in, helping to create a positive environment that encourages them to explore and learn new things. Pictures help them to understand things better as they begin to develop important reading and writing skills. Any daycare center or early childhood program needs to include picture books and bright, colorful posters and other decorations on the walls to make a child feel welcome. 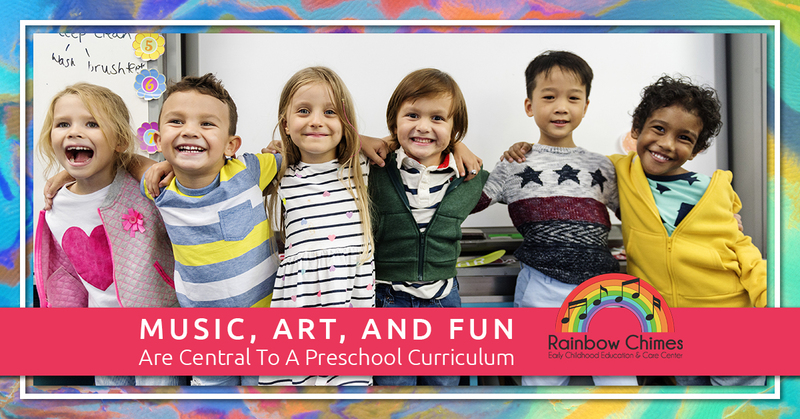 At Rainbow Chimes in Huntington, New York, our preschool curriculum makes sure to incorporate musical and artistic elements into our program so that every child benefits. Learn more about our fun and enriching environment your preschooler will love!